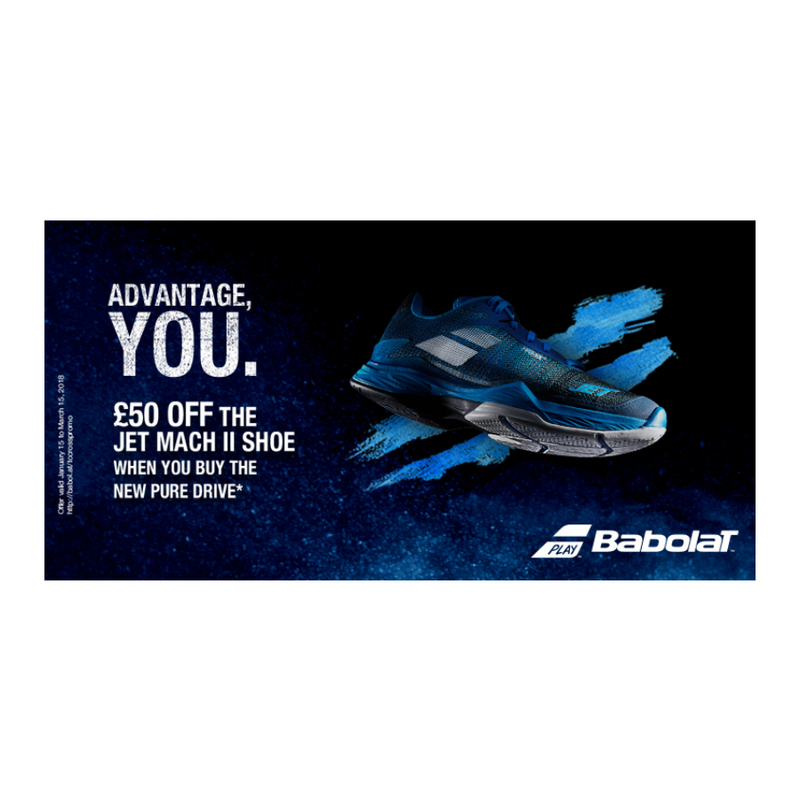 Its great when a brand like BABOLAT TENNIS put out a special offer like this – £50 off their NEW BABOLAT JET MACH II Tennis Shoe. A brand new, top of the range, piece of kit. All you have to do is purchase any of the new BABOLAT PURE DRIVE Tennis Rackets. ONE PAIR OF SHOES PER RACKET. We have the Babolat Pure Drive, the Team, the Lite and the Tour in the shop now. Come and try them out in the Hitting Room and let us explain the technology …..and try the shoes too so you get the perfect fit. As you all know Babolat fit on the small side so you can ‘t just rely on your regular size – plus, this is a new design, so again it will be that bit different. We have the BABOLAT JET MACH II Mens Tennis Shoe in Diva Blue – so shop now – and email us for immediate reply to info@pureracketsport.com for help with this DEAL. The Jet Mach II provides the best combination of speed and response. Using Matryx 2.0 this shoe has a one-piece upper that provides perfect lateral stability of the foot. Whilst the KPRS-X shock absorption system ensure the heel and foot stay protected. This entry was posted in Tennis. Bookmark the permalink. PING-PONG : The Original brand of Table Tennis Bat since 1901.